All 22 Women Senators Call For Senate To Address Sexual Harassment Democratic and Republican women have come together to ask that their chamber take up legislation overhauling how harassment claims are handled on Capitol Hill. 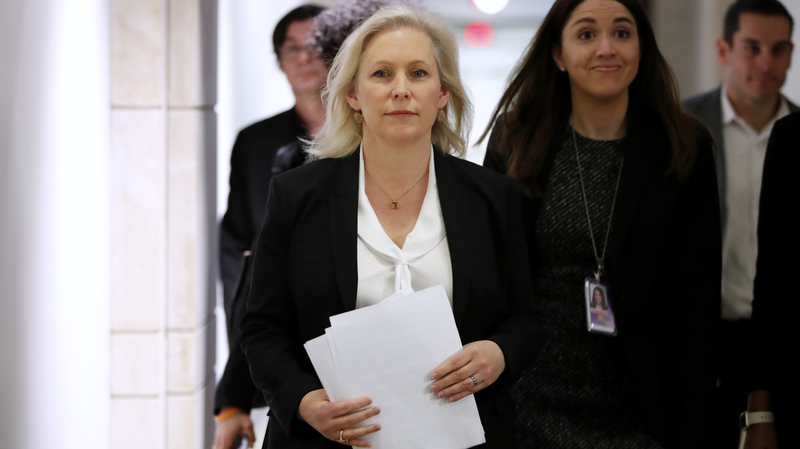 Sen. Kirsten Gillibrand, D-N.Y., arrives for a news conference on sexual harassment in the workplace in December on Capitol Hill. "Survivors who have bravely come forward to share their stories have brought to light just how widespread harassment and discrimination continue to be throughout Capitol Hill," they wrote. "No longer can we allow the perpetrators of these crimes to hide behind a 23-year-old law." Are Women Candidates Getting A Boost In 2018 For Being Women? That 23-year-old law is the Congressional Accountability Act, passed in 1995, and it dictates how harassment claims are currently handled on Capitol Hill. Members of both parties have criticized that system as outdated, and the House has already passed legislation that would make significant changes to it. "The process that somebody has to go through to file a claim is really kind of stacked against the claimant," Republican Rep. Bradley Byrne of Alabama — himself a former employment law lawyer — told NPR in January. Filing an official complaint about harassment on the Hill involves a multistep dispute resolution process that can stretch out for months, as described on the congressional Office of Compliance website. A staffer must first request counseling and that counseling period "normally lasts for 30 days," according to the Office of Compliance. Then, the staffer must request mediation, which also usually lasts 30 days. If that mediation doesn't resolve things, the staffer then can proceed with a lawsuit or have an administrative hearing, but can only do so 30 to 90 days after the mediation ends. In addition, taxpayer dollars have funded settlements to staffers complaining of harassment. The Washington Post reported in December that the Treasury has spent $174,000 on settling harassment-related claims over the last five years. In February, the House unanimously passed a measure that would overhaul the Congressional Accountability Act. That bill would ensure that lawmakers who harass employees pay for settlements out of their own pockets, and it would also simplify the complaint process. Though that bill enjoyed bipartisan support in the House, passing via a voice vote, the Senate has not taken it up yet. We write to express our deep disappointment that the Senate has failed to enact meaningful reforms to the Congressional Accountability Act of 1995. We urge you to bring before the full Senate legislation that would update and strengthen the procedures available to survivors of sexual harassment and discrimination in congressional workplaces. Everyone deserves to work in an environment free from harassment and discrimination. In November, with your leadership, the Senate took an important first step in the effort to end harassment and discrimination in congressional workplaces with the passage of S. Res. 330, which requires anti-harassment and discrimination training for all Senators and staff at least once each Congress. While this training requirement was a significant step to address workplace harassment, there was broad, bipartisan agreement at that time that more had to be done to support survivors. Although the Congressional Accountability Act (CAA) implemented meaningful reforms when it became law in 1995, it continues to require survivors to endure an antiquated dispute resolution process, including a month-long counseling session, forced mediation and a 30-day "cooling off" period before a victim can make a decision whether to pursue justice in a courtroom or continue with administrative procedures. The time has come to rewrite the CAA to provide a more equitable process that supports survivors of harassment and discrimination. The Senate's inaction stands in stark contrast to the bipartisan effort in the House of Representatives that led to the passage of bipartisan CAA reform legislation in February. The House bill includes a number of important provisions, such as eliminating waiting periods before a victim can take their case to court, increased transparency for awards and settlements, and a requirement that Members of the Senate and House pay for an award or settlement stemming from a case of sexual harassment or discrimination that they personally commit. When the Senate considers CAA reform legislation, we will also have the ability to address an inequity that now exists between House and Senate staff. The House of Representatives passed H. Res. 724 that provides House staff who are survivors of harassment or discrimination access to free legal representation. Senate staff who face similar harassment or discrimination must pay personally for legal representation or represent themselves through complicated legal proceedings. Therefore, the Senate must act quickly to provide Senate staff with the same resources as their House colleagues. Inaction is unacceptable when a survey shows that four out of 10 women congressional staffers believe that sexual harassment is a problem on Capitol Hill and one out of six women in the same survey responded that they have been the survivors of sexual harassment. Survivors who have bravely come forward to share their stories have brought to light just how widespread harassment and discrimination continue to be throughout Capitol Hill. No longer can we allow the perpetrators of these crimes to hide behind a 23-year-old law. It's time to rewrite the Congressional Accountability Act and update the process through which survivors seek justice.